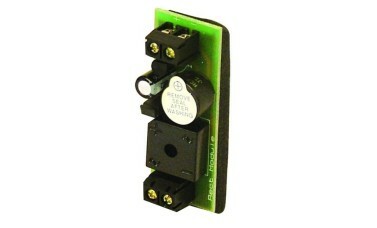 Alpro Rectifier Module Only for use with product with maximum current load of 1 amp. Enables electric strikes to operate with AC systems. Input voltage range is 12-24V AC +/-15%. Maximum current load is 1 amp (1000 mA). Must be protected from moisture. Hi, guys, my name is Darrel, and I am the head of the tech team here at LocksOnline. Thanks for taking some time to tune in and have a quick look of one of our product review videos. Now we've put these short little videos together to be able to give you our customers the opportunity to see the products that we have to offer and hopefully add more detail, in the flesh so to speak. So today I want to show you a rectifier circuit that we have, it's designed for access control solutions. Now, what exactly this particular rectifier does. If I can just give you a couple of minutes to explain it to you. Some intercom systems, if from years gone by and you are even using them to this day are AC based, so therefore then when you actually press the button then on your phone and release the door, the door would buzz, and that is demonstrating that you've got AC power source going to the strike release because it's the buzzing from the AC signal. But a lot of access control solutions is a while now or locking solutions for the doors are all also DC. So if you wanted to have an AC intercom and then you wanted to control a DC mag or a DC lock that's on the door etc, then you need to be able to change the voltage. Now the old way that you used to do it is that you would have a power supply, and then you would have an AC relay, and then the power supply would trip the DC lock. This particular device here allows you to use the AC from the intercoms system or the access control solution and convert it to DC and therefore then you can then use DC-based locking product, direct current locking products on your door. Another distinct advantage with this particular unit is well, there isn't really that much to it to one degree, but it also has a buzzer that's on the unit as well and then a jumper to be able to switch the buzzer off. So the idea of this is that because when you've got a DC strike release, it just clicks so you got no noise to indicate that the release has gone. So people could be standing outside the door waiting to hear this buzz sort of notice that you would expect from an AC strike and, of course, nothing happens. And so this little demodulator here will create the buzzer, and that buzzer is what you would here then and give you the alert to open the door. It is disable-able so you can pull this link out just here and you will be able to disable it if you need to, that's that link just there. Now the input onto this is anything between 12 and 24 volts and therefore then, the output can be anywhere between 12 and 24 volts. So 12 to 24 volts AC in 12 to 24 volts DC out. 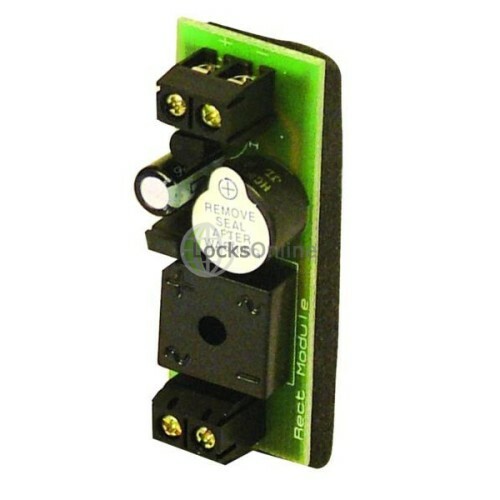 Now one thing you have to bear in mind with bridge rectifiers is that you will get voltage drop - it's a classic. So for you to be able to get your 12 volts, the idea is that you would need at least somewhere in the region of just over 13 volts, maybe 13.4 volts to actually come in. It's a silicon based product who require 1.4 volts in which to drive the circuitry. So you are going to get a little bit of voltage drop, so you've got to be mindful of that if you plan on using this. So most certainly check the amount of AC that you have before you think of buying one of these. This particular device also has on the back of it here is a sponge pad that allows you to be able to peel that off there and it allows you to be able to stick that in say a power supply or in a box somewhere quite easy and out of the way and quite discreet in that respect.